Welcome to Year 2's homepage. We hope you find it useful. We will be updating it regularly, so you can follow our learning journey. Our topic this half term is 'London's Burning! ', with a specific focus on the Great Fire of London. We kicked off our topic by becoming history detectives and travelling back in time to when London experienced a very traumatic event. We followed footprints, which jumped back 10 years each time, until we reached the year this very important event took place, 1666. We discovered that is happened 350 years ago! We followed this up by reading a newspaper extract taken from that time, and collecting some facts detailing the events that took place. We have also listened to a story of how the fire started, and sequenced some pictures to retell it in our own words. In Art and Design we are going to recreate a landscape of London up in flames. We have collaged our background, using a selection of fire colours and next week we will be creating a silhouette of the London skyline to glue on top. We are very excited about our new topic, and have already learnt a lot about this very important but sad event that happened all those years ago. We are looking forward to continuing our learning journey. Year 2 visited the Search Museum to take part in a Roald Dahl workshop. We had the opportunity to listen to extracts taken from lots of Dahl's magical stories, and then do some activities linked to the storylines. Matching nuts to their tree. Safa dressed as Aunt Spiker. Alayla dressed as Willy Wonka. Bethany catching some good dreams! I hope you are all happy and working hard. 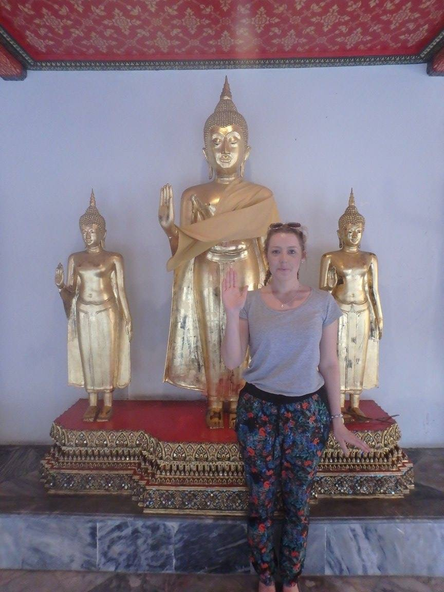 I am coming towards the end of my travels in South East Asia. When I last spoke to you I was in Thailand. To finish my time there I went to a place called Koh Lanta. 'Koh' in Thai means island. It had a lovely beach and was a very calm place. It also had the most beautiful sunset! Next we went to a country that some of Matthew's family are from. I wonder if you can tell everyone Matthew?! Whereabouts in Malaysia is your dad from? Maybe you could find it on the map?! We flew into Kuala Lumper, which is the capital of Malaysia. Whilst there we went up the second tallest building in the world and looked at all the buildings lit up below. From Kuala Lumper we went to Penang. This town had a lot of street art, a bit like when we created some Banksy street art last year! It was fun exploring the town and looking at pieces of art hidden around the corners. Whilst in Malaysia we were there for the end of their New Year celebrations. We joined the locals for some food, watched fireworks at a festival and visited a temple that was lit up with thousands of lights. After Penang we visited Langkawi, which is an island in Malaysia. Instead of staying in a normal hostel we stayed in a room that was like a huge tube! It could only fit a bed in and was very strange to sleep in. I felt a bit like a hobbit from Lord of the Rings! Botanical Gardens. If you were really quiet you could see and hear lots of different creatures- we even saw a monitor lizard! Our next stop was Bali which is an island in Indonesia. We stayed with a lovely family, who were very kind. We visited a famous temple called Uluwatu and watched a fire dance which told the popular story of Rama and Sita. We also travelled to another place called Ubud, and whilst there we visited a monkey forest and some rice fields. To end our time in South East Asia we travelled by boat to the Gili Islands, which are also in Indonesia. We visited Gili Trawangan and Gili Air and both were stunningly beautiful! The people are not allowed to drive on the islands, so people either walk, cycle or travel via a horse and cart. We decided to cycle around the island, as they are only small. It gave us the opportunity to pass through the lush countryside, with towering palm trees and winding pathways. My favourite beach had clear turquoise water and white sand. In the water there was a swing that you could relax on whilst looking out to the horizon. I am now sat in the airport, waiting to board my plane to Australia for my next adventure. I wonder if it will be just as much fun as South East Asia?! Not long now until your Easter break. I hope you all enjoy time with your family. I hope you're all well and looking forward to half term! It's been a while since I last emailed you and since then I have visited a few more places. The last time I emailed you I had just arrived in Vietnam, in a city called Ho Chi Minh. I really enjoyed my time in Vietnam and so far it has been my favourite place to visit. When I was in Ho Chi Minh I visited some underground tunnels in the forest that had been dug by the people in Vietnam to protect themselves during a war. It was amazing how they managed to fit through the tunnels, as they were so small! After this city we travelled to a town called Hoi Ann. This was completely different to Ho Chi Minh because it was in the countryside and therefore a lot calmer. It was a very pretty town- at night they lit up lanterns of all different colours and hung them from the trees. You could even drop a lantern into the river and make a wish, as it sailed down. My favourite day whilst there was getting a boat to an island and cycling around to different places. I saw the ladies in the fields picking rice, visited a lady's house and helped her to weave a sleeping mat, I saw some men building a boat and lastly I visited a house to watch a lady and man make some rice crackers. We were allowed to try some, and they were delicious! My next stop was the capital city of Vietnam, Hanoi. This city is at the top of Vietnam and is very very cold at the moment! I did two trips here, a boat trip and a hike in the mountains. I enjoyed my trip to the mountains but it was extremely cold- it even snowed! We did a 5 hour hike to get to a village in the mountains, and it was a lot of hard work! I'm surprised I didn't slip up in the mud/snow as there was lots of it! That night I ate and slept at a home that belonged to a family in the village. It made me realise how luckily we are, as their homes are very basic. They didn't have things such as central heating and had to rely on a small fire to keep warm. The lady cooked us a lovely dinner and thereafter we went to sleep.....in lots and lots of clothes, including a coat, wooly hat, gloves and scarf!! I have been wearing the one you got me for Christmas Ellie! After my trip to Vietnam I flew to another country, called Laos. I stayed in a city called Luang Prabang. It was very pretty here and had two rivers- Nam Khan and the Mekong river. On one of the mornings we got up really early to watch some thing called 'The Procession of the Monks'. This is when the monks from each temple walk along the street with a special pot to collect food from the people in the town. Often the people will give them sticky rice. The monks are only allowed to eat their food until midday. Another day, we crossed a rickety bamboo bridge and walked to a village where they make there own paper. It was very interesting to watch! I am now back in Thailand and staying in a city called Chiang Mai. My favourite day was probably when I visited a sanctuary for elephants. This is a place that looks after elephants that have been badly treated. The 3 elephants we met were all female, and one of them was a baby. We mixed together ingredients to make their medicine, fed the elephants bananas, went for a walk with them in the jungle and then got to wash them in the river- this was the best part! The baby loved being in the water and even squirted us with some water! Well, I think that's enough news from me! I hope you all enjoy your last week at school before half term! I will send some photos when I can! Afternoon Year 2, or should I say good morning?! I am seven hours behind your time. Whereas it is the morning back home in England, it is my afternoon, which may seem very odd! I am currently in a country called Cambodia. I wonder if you can find it on the world map? It is very different here to England. Although it is Winter in England and you have been having lots of rain, here it is the North East Monsoon season, which means dry weather and very warm temperatures. Yesterday I went on a boat trip to see a floating village and forest. The houses along the river looked very different to those in our country. They were built from wood and were on stilts, so they were very high up! The families who lived there had to climb up ladders to get in. I wonder why they were built so high? Maybe you could find out? A lot of the people that I passed were working along the river. The men were catching fish from the river and doing jobs like fixing boats, whereas the ladies were looking after their children and some were in smaller boats and taking visitors out to the forest. 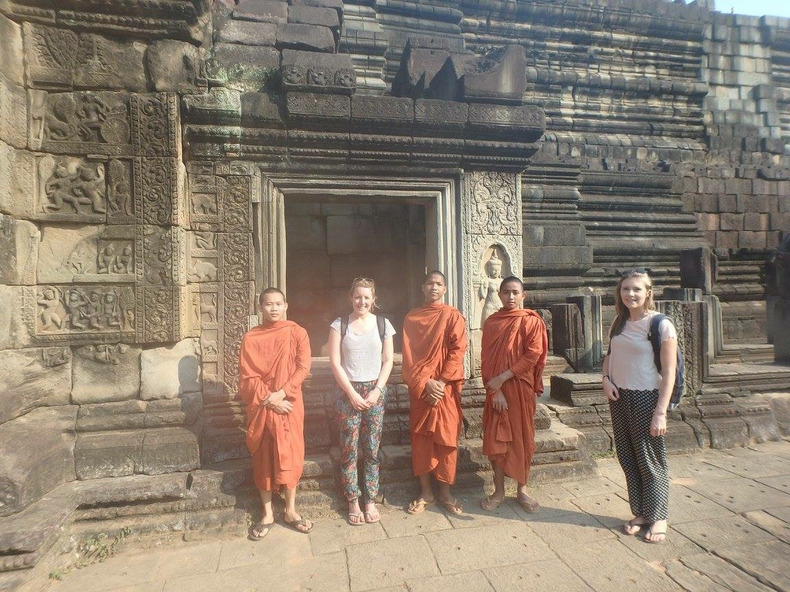 As well as Cambodia I have also been to two other places in the past week. 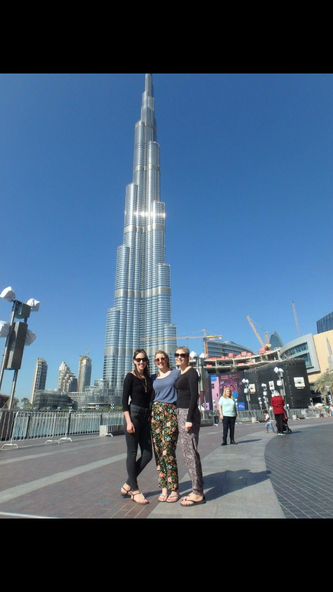 My first stop was Dubai, which is a place in the Arabian desert in a country called the United Arab Emirates . During one evening I went into the desert in a jeep and went 'dune bashing'. This is when you can ride up and down the sand dunes, which are hills of sand. It was a lot like going on a ride at the funfair; very very bumpy!! 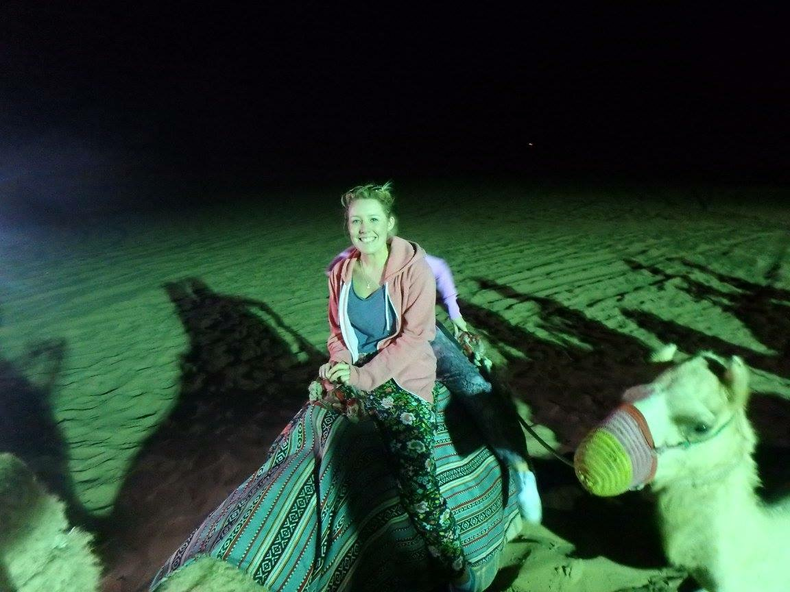 I also rode on a camel and went on a board down some of the sand dunes, a bit like snowboarding but with sand instead! After this we experienced some of the Emirati culture. This included watching some traditional dances, eating some of their favourite food (we sat on cushions at very small tables to eat) and dressing up in traditional clothing- I even had a henna pattern on my hand, a bit like yours Safa! After my stay in Dubai I went on another plane to a city called Bangkok. I wonder if you can find out using the map what country this city is in? For New Years Eve I went to a temple, which where people can go to pray. It was huge and had lots of pretty designs. Some of the people dressed up in colourful clothes and wore masks. We watched them do some special dances and listened to them sing songs and play their musical instruments. To celebrate the beginning of the new year we watched an amazing firework display near the river. The King even sailed past on a boat and we gave him a wave. I hope you all had a lovely Christmas and are now ready to do lots of learning now you are back at school! I will try to keep you updated about my journey as I go along and send some pictures. Well done for finding all the places on the map that I gave you clues for! You will be great explorers after my trip has finished! The last time I sent you a message I was in a city called Siem Reap. This is well known for its ancient temples. The most famous temple is called Angkor Wat and if you look at the Cambodian flag you will see what it looks like. There were other temples that I visited too, one of them was used in a famous film called Tomb Raider. 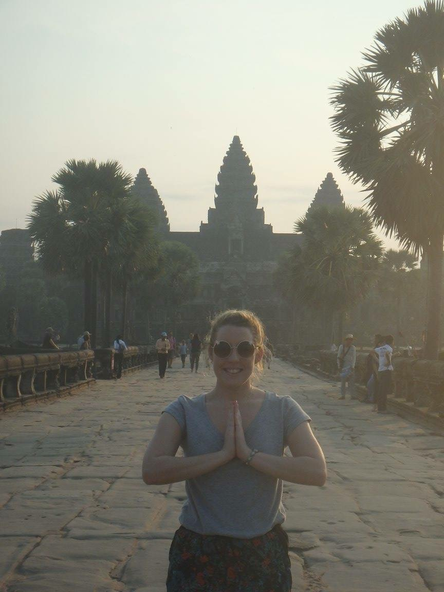 Angkor Wat is the largest group of holy buildings in the world! There were so many temples we had to get a tuk tuk to drive us to them. I wonder if you could research what a tuk tuk looks like? After a week in Siem Reap I travelled to a different city in Cambodia called Phenom Penh. This is the capital city of Cambodia, like London is the capital of England. It was extremely busy in this city!! You have to be very careful when crossing the road as there is so much traffic and not many rules for drivers! We spent 2 days in this city. The first day we visited an important place, although it was also very sad. It was where a lot of people lost their lives not too long ago and it was a place to remember them, a bit like how we remember the soldiers on Remembrance Day. After that we visited the city museum, which had a lovely garden and lots of statues of the Buddha. He is extremely important to the Cambodian people. I wonder if you could find out a little bit about Buddhism and what the Buddha looks like? The next day we went to another museum and then we visited the Grand Palace, where the King still lives today. Today I went on a coach journey for 6 and a half hours and have arrived in a different country- Vietnam. I wonder if you can find this on the map? I am in a city called Ho Chi Minh and am excited to explore this city for the next two days. Year 2 have had an amazing start to 2016 – an important year for them. 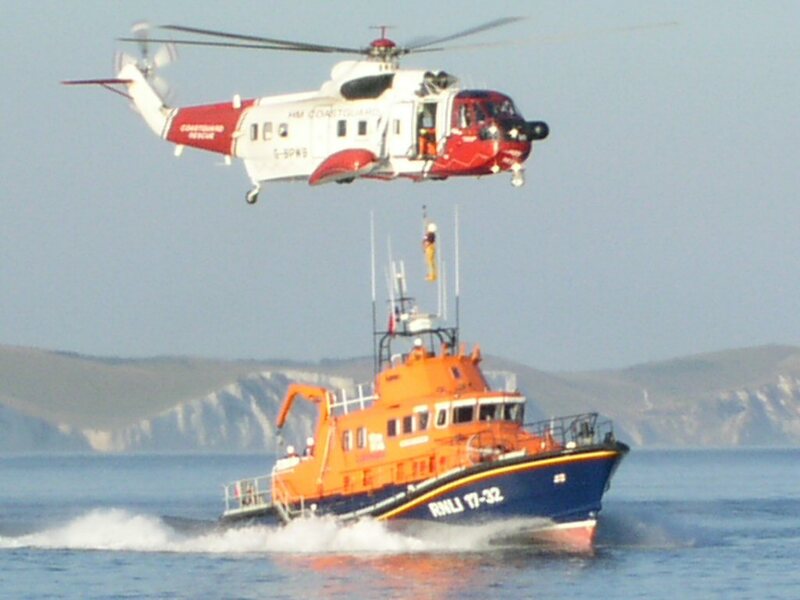 Our topic has been “Rescue at Sea”. The children have learnt about Grace Darling’s dramatic rescue and how seafarers are rescued today. They have had great fun designing and making lighthouses with a winding mechanism, to get Mr. Grinling’s lunch up to the top of the lighthouse. After the holiday they will learn how to complete a simple electric circuit to light a bulb in the top of their lighthouse. I have been overjoyed by the enthusiastic response to the project homework. The children have clearly enjoyed the topic and have been producing work for display at every opportunity – including at sleepovers! That is real dedication. Thank you. In writing the children have learnt about the way using adjectives, adverbs and similes in writing can make stories really come alive. They have also learnt the rules of punctuating speech. They then used these skills to write their own story of a rescue at sea. There will be a year 2 SATS evening on Wednesday 2nd March at 5:30pm. Please come along and find out what we are doing to prepare the children for these assessments and how you can support your child. I hope you are all well. I've been in Australia now for over a month. It is a huge country all the way on the other side of the world. I am 9 hours ahead of you, so when the sun sets, it will be your morning. The seasons are also the complete opposite. It is Autumn here at the moment and will soon be winter. It has been great fun spotting lots of animals that can only be found in the wild in Australia. Some of the animals I have seen include a Tasmanian devil, a koala bear, a wallaby, a wombat, and a kangaroo. I wonder if you can find out any other animals that are native to Australia? I also visited a koala hospital which took care of injured and poorly koalas to hopefully return to the wild. A few of the cities I have visited are Melbourne, Sydney and Brisbane. I wonder if you can find any of these on the map? Are they on the east coast or the west coast of Australia? The beaches out here are beautiful, especially when the sun sets. My favourite beaches were in a town called Noosa. We even spotted wild dolphins jumping in the waves. I have just come back from a weekend on the biggest sand island in the world- Fraser Island. We travelled in a 4x4 bus, which was like being on a roller coaster because there were lots of bumps in the sand tracks! We swam in fresh water lakes, went paddle boarding, hiked in the rainforest and climbed huge sand dunes. Fraser Island have dingos, which are dogs that live in the wild. These dogs are very dangerous but you can watch them from afar. Unfortunately we didn't see any when we were there. We are now heading towards Cairns, which is where the Great Barrier Reef is, and plan to do some snorkelling whilst there. Perhaps I will find Nemo?